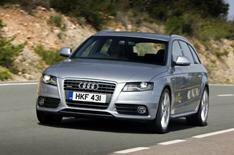 First drive: Audi A4 Avant | What Car? Someone should report the A4 Avant to the Monopolies Commission. It has outsold all other prestige small estates every year since first going on sale in the UK in 1996 - the equivalent of one team hogging football's Premier League title for 12 years - and there's no sign that run is about to end. Here's a new A4 Avant that's a bit better at almost everything. It sits on a new, more agile chassis, and it has a revised family of engines (beginning at launch with a 1.8-litre turbo and 2.0 and a 3.0 V6 diesels). There are also options which have never previously been available, including the ability to personalise how the suspension, steering and even the accelerator respond through the Audi Drive Select system. It's also more convenient to use, with a power-operated tailgate on most models, and there's more passenger and cargo space. The A4 now has a bigger boot than either the BMW 3 Series Touring or the Mercedes C-Class estate, though the Merc steals the advantage back when the rear seats are down. There's a quick-release luggage cover, and the option of a neat cargo-securing system. In true A4 style, the new Avant is a discreet car, though no less handsome for that. It's also likeable to drive, stable, grippy and quiet. Four-wheel-drive models kick up a bit more road noise than those that drive only the front wheels, and Drive Select, which comes with lowered suspension, adds an extra element of stiffness to an already firm-ish ride. Which engine? The 2.0-litre diesel instantly commends itself to company car users because of the tax advantages it bestows, but with the cost of diesel accelerating way beyond that of petrol, the effortlessly driveable 1.8 turbo might just work out to be a better bet. We said at the start that the the new Avant was better than its predecessor at almost everything. It has three obvious weaknesses. The rear seats don't fold completely flat, the pedals are offset way to the right, and a company whose name has become a byword for quality seems to have skimped on some dash plastics. • The A4 Avant is on sale now, with prices from £23,400 to £34,390.